These are some of the easiest little cakes to make, which has made them a favorite among kids who want to help in the kitchen. The combination of maple syrup, coconut milk, and cocoa in these cupcakes is absolutely divine, and they use ingredients you are likely to have in your pantry if you are cooking dairy-free or vegan. Just about any frosting is delicious on these cakes, but peanut butter frosting, in particular, is a favorite among kids and even a few adults in my family. Think of making a batch of these cupcakes for birthday parties or gatherings where there might be children or adults who are sensitive to dairy. You can have fun decorating them to make them festive or to match the theme of the gathering. A tray of chocolate cupcakes decorated in your team's colors would be welcome for dessert when tailgating or hosting a game-watching party at your house. Preheat the oven to 350 F. Line about 14 cups in a muffin or cupcake pan with liners. In a medium-sized mixing bowl, sift together the flour, cocoa powder, baking powder, and salt. In a small mixing bowl, whisk together the maple syrup, coconut milk, canola oil, melted chocolate yogurt, and vanilla. Add the maple syrup mixture to the dry ingredients and stir until just combined. Portion the batter into the cupcake cups, filling each about two-thirds to three-quarters of the way full. Bake for about 20 minutes, or until a toothpick inserted into the centers of the cupcakes emerges clean. Allow cupcakes to cool completely on a wire cooling rack before icing with desired dairy-free frosting. 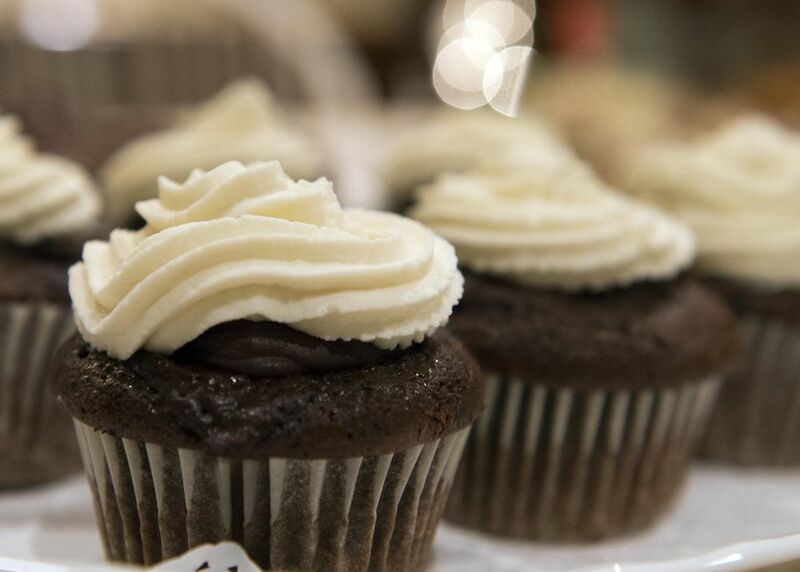 If you won't be using the cupcakes the same day, consider leaving them unfrosted. Because they have no animal products, they can be stored at room temperature for up to two days. It's best place them in a sealed container or wrap with plastic wrap to keep them from drying out. For storing longer, wrap the unfrosted cupcakes individually in plastic wrap and place them in an air-tight container. You can store them in the refrigerator for up to seven days or in the freezer for four to six months. When you wish to use them from the freezer, allow them to defrost on a cooling rack, which will ensure the bottoms of the cupcakes won't get soggy. They will take between 30 minutes to three hours to thaw.